Our KLCI futures look set to regain 1,600 by end of today. Beware of selling pressure which should come in heavily at 1,600. Any LONG positions, exit by 1,600 & wait for another LONG entry after the correction wave (which should be ending at around 1,585 level). Stocks investors can rest assured as I believe we are looking at breaking the previous high of 1,609 either by end of June or by early July. My target for our new peak will be +/- 1,615-1,650. Woah!! 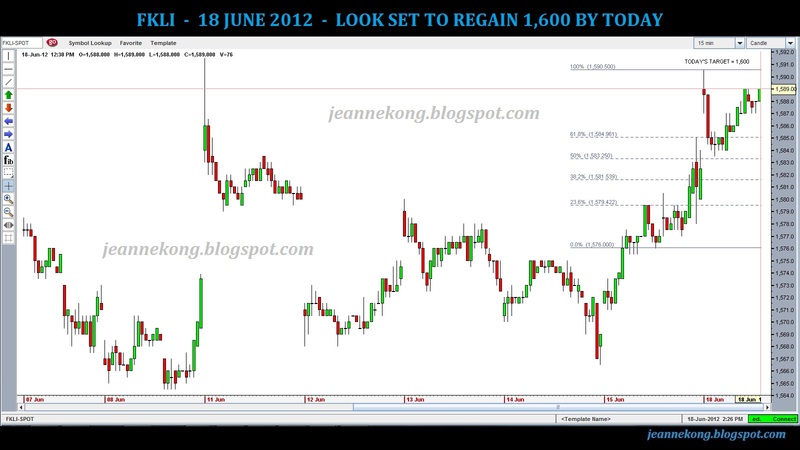 That will be very much in-line with my KLCI 1H2012 forecast at year start. However, beware after achieving new peak as the ensuing correction for the current rally since Oct'11 recovery from the US credit rating downgrade plunge will be SCARY!!! good, my view is the same 1600. Woah!....nice to know we share the same view! :) keep in touch! Oops...Gain on the index earlier in the morning pared down after the Spain 10-year bond yield shoot to a high of 7.08%; above the threshold 'safe yield' of 7%. The 7% level is widely seen as a critical point, with borrowing costs in Portugal, Ireland and Greece skyrocketing after breaking the level, eventually leading to bailouts. 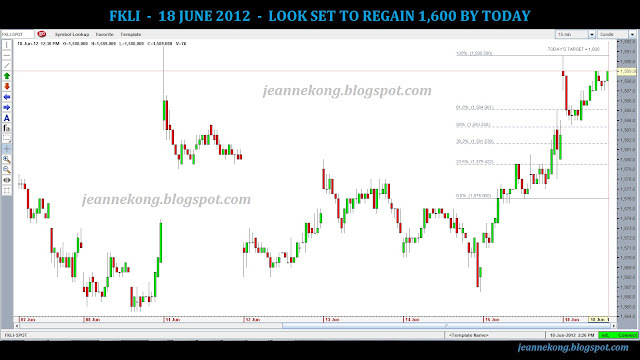 We took a U-turn & correct to the immediate support @ 1,575-1,580 range, currently (1659 hr).